Railpictures.ca - Dave Burroughs Photo: All Aboard! The crew is onboard, the white flags are flying and we are ready to go. 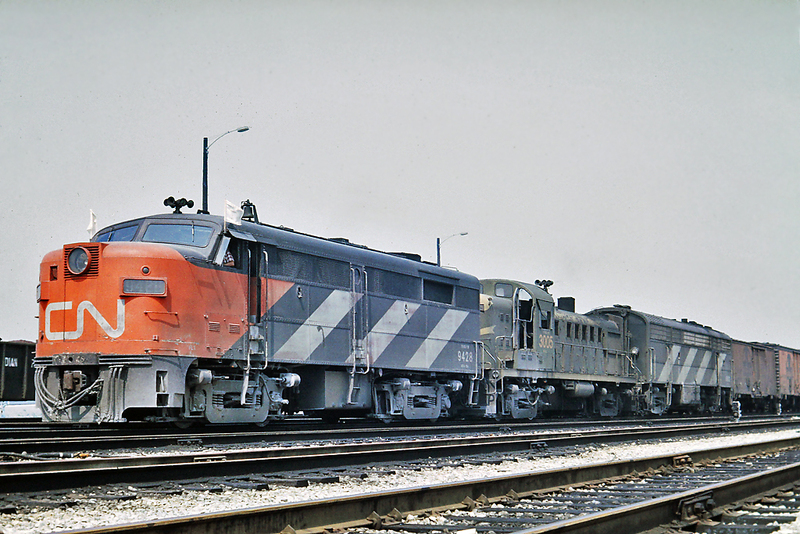 Quite the mix of power for CN with 9428-3005-6805 with orange Santa Fe refrigerators on the head end. I photographed this power set being prepared on the ready tracks earlier on at what is now MacMillan Yard. The power moved from the ready tracks to the departure yard where this picture was taken. The geotagging may not be exact as I do not remember exactly where I was located for this shot. | Railpictures.ca – Canadian Railway Photography – photographie ferroviaire Canadienne. Caption: All Aboard! The crew is onboard, the white flags are flying and we are ready to go. Quite the mix of power for CN with 9428-3005-6805 with orange Santa Fe refrigerators on the head end. I photographed this power set being prepared on the ready tracks earlier on at what is now MacMillan Yard. The power moved from the ready tracks to the departure yard where this picture was taken. The geotagging may not be exact as I do not remember exactly where I was located for this shot.